We are a big fan of Webroot so far. Still waiting till kaseya gives you guys all info required to make the machine id, all group info and view able to copy to the webroot module. Hope to see more nice features soon! You will need to run the downloaded executable on the same computer as the VSA then reapply schema. 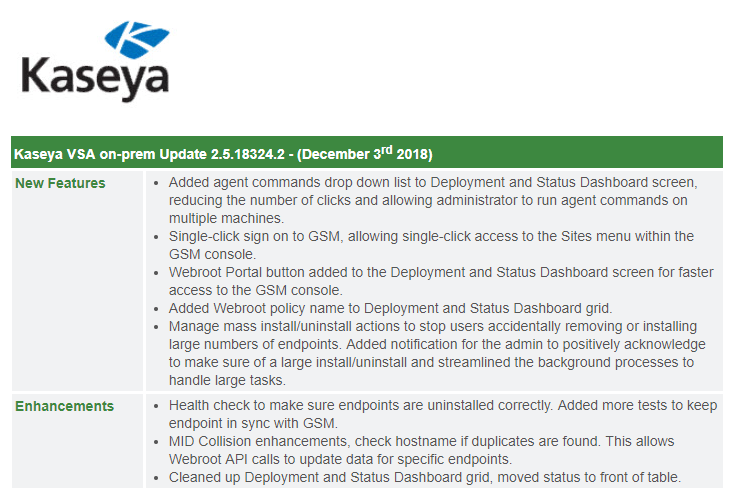 Some great updates in here that will help us manage Webroot through our VSA better! Is this a manual update that needs to be run on the VSA each time there is an update? I ask because we have maintennace windows on our VSA where we would manually run updates / patches, reinstall the datababase schema, and rebooting, ensuring functionality once done.